The modern disposal system for incontinence products. If you are a caregiver for a person who suffers from severe incontinence you understand the issues associated with discreet and sanitary disposal of the products. Traditional methods of disposal often caused odors throughout the house, embarrassment for the afflicted person or unsanitary receptacles. Odors throughout the house: Typical incontinence supply receptacles do not have any features for odor control, which means the entire house may end up having a foul odor if the bags are not changed several times a day. Odors to the plastic receptacle: Most plastics will absorb an odor is exposed to it for long periods of time, which can further increase the smell throughout the space. Indiscreet disposal: If you dispose of an adult diaper in a traditional trash can there is not discretion or ability to shield the product from guests or visitors, which may cause embarrassment for the afflicted person. Unsanitary conditions: Having adult diapers lying around in trash cans is not sanitary; also if the diaper opens or leaks in any way it can contaminate the entire unit. However, the unique features of this unit do not stop there. 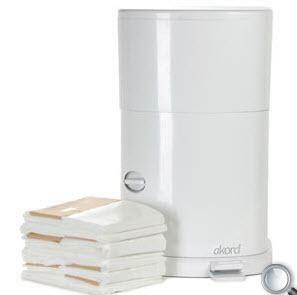 The diaper pail is available in two convenient sizes to ensure the needed capacity is available. The large unit is perfect for medium and large sized incontinence products, while the extra-large pail is perfect for large and extra-large products. Additionally, they can be used for disposal of all types of products associated with incontinence control, including: diapers, pads, briefs, gloves and bed pads. Sanitary, discreet and controls odor. If you are a caregiver for a person who suffers from incontinence, you understand the necessity of having a proper disposal method for the used products. Most traditional methods of disposal had you taking the trash out several times a day to avoid the odor associated with the used products. Now, with the large capacity, the Akord diaper pails can hold three to four days’ worth of products while not allowing any unpleasant or foul odor to escape. Additionally, when it is time to change the liner, it is a simple process that takes less than a minute. Having convenient supplies for caring for an individual who suffers from incontinence makes your life easier. Additionally, with this diaper pail, being able to discreetly dispose of adult diapers used for bowel movements is an easy process that allows you as well as the surroundings to remain sanitary and odor free. The CareGiver Partnership is a national direct-to-consumer retailer of home healthcare products for incontinence, skin care, mobility, daily living aids, nutrition support and more. In its sixth year of providing products and services that help caregivers and loved ones maintain personal dignity, the company also offers an online library of more than 1,200 family caregiver resources and personal service by experts in caregiving. Call 1-800-985-1353 or visit online.